In addition to peddling caffeine and flirting for tips, baristas have another serious responsibility: the sacred role of the DJ. 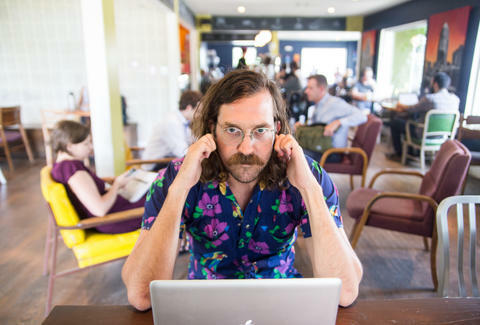 No matter how good the coffee or free the Wi-Fi, terrible tunes are the aural equivalent of spitting in your drink, and nobody wants that type of dirty chai. Java-slinging iPhone jockeys take note, here are 13 such tunes that should never reverberate off walls hung with crappy local artwork ever again. Alright, already. It was understandable to enjoy this when it came out in 2004, but after 11 years reigning as the ultimate indie crossover hit, there's simply no joy left to squeeze out of this song. Especially in the context of a coffee shop, where this type of jangly guitar is the equivalent of pink sugar packets: always present, but for no discernible reason. The dainty vocal style of Leslie Feist is like pumpkin spice grated directly into your eardrums. Bob Marley - "Is This Love?" Although Jah may strike me down, the smoother style of the latter-day "Natural Mystic" does not pair well with coffee, even if it's grown by Rohan Marley himself. After the age of 25, use of Beatles songs should be restricted to seducing hippie princesses and placating parents. At this point, playing this free-spirit anthem in your coffee shop means it is anything but free-spirited. This melancholy, rainy day electro-pop deserves credit for soundtracking many a dorm room dry-hump, but in the context of sipping a coffee and writing emails, it makes you feel like you're in a post-crisis scene in the second act of a romantic comedy. Any day of the week, this song is the equivalent of an iced, skim milk, vanilla latte. With extra skim. Here the rock and roll barista is digging into the old reliable corners of his music library to bring you the bombast of Bonham, the torpedoing riffs of Jimmy Page, and some general vocal howling. If your coffee shop dares to have a stereo sound system (a bad idea), the song's big breakdown is going to ping-pong between speakers in such a way that will make anyone listening want to get the Led out. Otis Redding is the only person who is allowed to whistle in coffee shops. Playing Pinkerton in its entirety is a move that I can respect, even if it makes me want to crumple up straw wrappers and use them as makeshift earplugs. But anything off the Blue Album, specifically "Buddy Holly," makes me feel like I'm either in a Gap commercial or my parents' garage. I love Bill Withers, but he'd be the first one to tell you that coffee shops have used this song up. Dave Grohl is the Kool-Aid Man of alt rock, and I don't need anyone crashing through the walls while I'm trying to mind my own business, or the business of people I barely know via Facebook. Washed Out - "Feel It All Around"
This is also known as the theme song from Portlandia, which is really all that needs to be said. Dan Gentile is a staff writer at Thrillist. 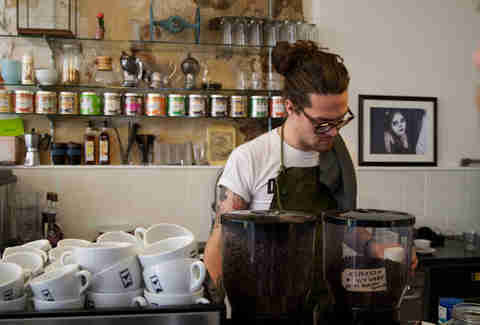 As a barista he once played Brian Eno's Bell Studies for the Clock of the Long Now and loves to talk about it. Follow him to very detailed opinions about Eno's mid-'70s work at @Dannosphere.